Expect more than flesh wounds in a History Channel series about the Knights Templar that will screen on Sky’s premium drama showcase, SoHo. Knightfall will play 8.30 Wednesdays from December 13, a week after its US premiere (where History hopes it will be another Vikings, which Sky lost to the fledgling Lightbox). 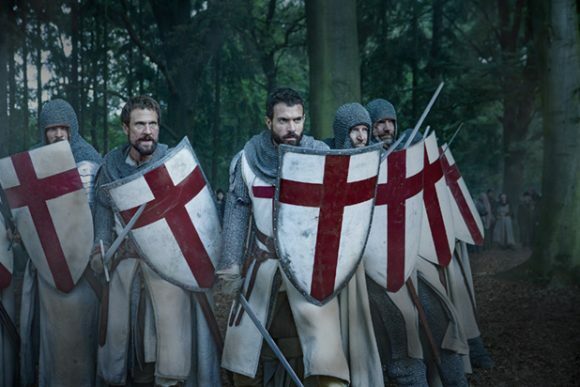 The 10-episode series dramatises the medieval politics and warfare of the Knights Templar, the most powerful, wealthy and mysterious military order of the Middle Ages who were entrusted with protecting Christianity’s most prized relics, including the Holy Grail. Executive produced by Jeremy Renner, it stars Downtown Abbey’s Tom Cullen and Jim Carter, The Tudors’ Padriac Delnaey and Dominion’s Simon Merrels. ➢ Michelle Wolf: Nice Lady: Stand-up comedy special in which The Daily Show With Trevor Noah contributor shares her observations on feminism, dating and other social issues (December 27). And being resurrected for box set weekends are: Episodes (S5), Vice Principals (S2), Game of Thrones (S7), Curb Your Enthusiasm (S9), American Horror Story: Cult and The People v OJ Simpson: American Crime Story. Hi Trevor and Phil, I too have an Apple TV and noticed a new TVNZ app, will download when I register for an account. My question is, does TVNZ stream in proper HD on the Apple TV? Good question, Rosco. I have an earlier Apple TV that’s too old for the Three and TVNZ apps. Does anybody else know? Cheers, both. I’ve registered and downloaded the ATV4 TVNZ App … Mrs Rosco is currently catching up on Masterchef … and the lack of HD is pretty noticeable … I did look at Dr Foster Season 2 and that also looked HD-less … I’m not sure if it’s one of those broadband speed things, but I’m on 100mb fibre so plenty of bandwidth. Thanks, Rosco. TVNZ used to say their adaptive streaming is near-HD. Now that it’s aggressively expanding its channels’ availability, I’ll check next week to see if we can expect resolution improvements. Thanks Phil, as some further feedback, in fairness Sunday afternoon internet traffic is such that further binge watching of Masterchef is actually looking pretty good. Perhaps not quite matching the HD performance of Netflix, but it looks alright. Would still be very interested to hear what TVNZ say about their playback – would be nice to get a HD commitment from them! Hi Phil. Some further time with the ATV TVNZ app meaning my entire household (kids included) are now bingeing on Masterchef Ughhh! … anyhoo … my question is … are the shows on TVNZ, like Masterchef, supposed to be advert free? Yes, Masterchef has its natural breaks, but these don’t flow into the next segment of the show. Quite regularly these breaks are broken up with toilet paper adverts, bank adverts amongst others. Isnt TVNZ on-demand supposed to be advert free? Cos it isn’t at the moment … it’s getting closer towards its terrestrial cousin?! Hi Phil, any news on when SoHo will show the HBO documentary Spielberg? I’ll check but invariably SoHo retains one-offs like these to bridge gaps between one series ending and another starting. So it doesn’t screen them with the urgency that it does most HBO shows. Sky says it will screen next year, initially as part of a pop-up movies tribute to Spielberg. So slow! Seen Spielberg and it’s a good look at the director and his work.